After three 40-min long visits to their Nicosia HQ I managed to get a broadband internet contact with primetel. Having spend 10 years in UK and US, I would rate these guys with 3 out of 10 on customer service alone. If only they could spend some money on training their personnel, or hiring people with some skills, instead of their fancy advertising campaign they would have been far better. Why on earth it takes 15 working days, that's three weeks, to get a connection. Billing allover the place, hidden charges everywhere and lots of delays. They've even charged me a fee for printed billing whist I am getting my invoices by email. I would avoid them if I could, but there's very little if any serious competition around. Sales persons are incredibly oblivious of the technology they use, argumentation ludicrous (just stand on the queue to hear what they are telling unsuspected customers who are not familiar with internet communications. "NO COMPETITION => NO QUALITY OF SERVICE"
Please visit www.thunderworx.com for more information and online utilities. PING 62.152.1.68 (62.152.1.68) from 217.27.32.200 : 56(84) bytes of data. as i have read all the comments, i see that 99% of them are negative. of course people will have problems. i have primetel and i have no problems at all. i had cyta and i had to restart the modem all the time, i paid for 1mbps ang got maximum 600kbps. at primetel i pay for 2 mbps and never got lower than that! i believe that everyone says that primetel is not good because people only listen to negative comments. no one looks at the positive ones. of course people will have problems, there is no way u can have 30000+ clients and have all of them satisfied. I am just a satisfied customer telling my opinion about my provider. i think that more people are satisfied than dissatisfied but mostly dissatisfied people look for forums to tell their opinion! akouse kanenas pote diplasiazoun tes taxitites k stin primetel? Eimai kainourgios sindromitis k pragmatika entiposiastika apo tin eksipiretisi tous. Polla anoteri apo tis cablenet. H alithia einai efia apo cablenet epidi metakomisa alla an diplasiasei tes taxitites i primetel sintoma tote en tha to metanioswn pou afisa piso tin cablenet. 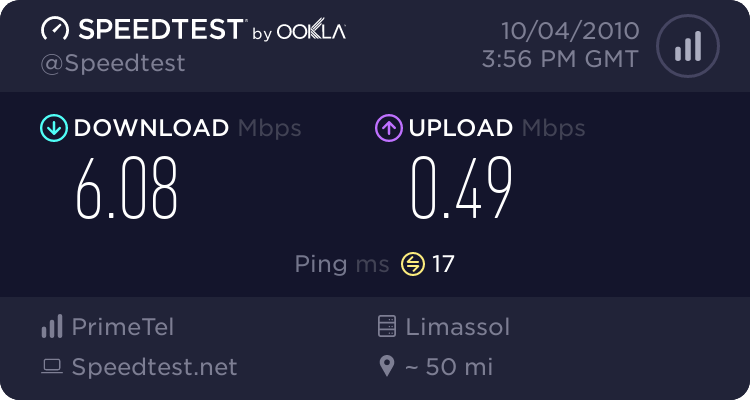 An den tis diplasiasei sintoma omos tote en na exw metaniosei polla :/ Giati kalitera 10mbit me kaki eksipiretisi para 4mbit me kali eksipiretisi. To kako exoun klidomeno router k en se afinoun oute SSID na allakseis oute to password tou Wi-Fi. Giati edialeksan na kamoun etsi prama en borw na skeftw. An exeis omos ena extra router diko sou to xrisimopias ekino k en exei provlima. Αφού τώρα εν να τις διπλασιάσει και η Cyta εν νομίζω να μην τον κάνει και η Primetel. kopelia apistefto! afto tha pei antagonismos! It's not a question of the speed, more one of how much it will cost. 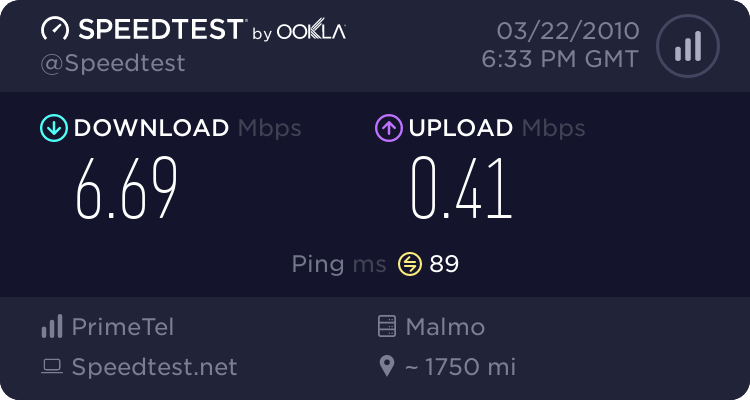 69 E's for 20Mbit from Cablenet, extrapolate that up and I'm guessing we're looking at a minimum of 250 E's for 100Mbit, who is going to pay that much? 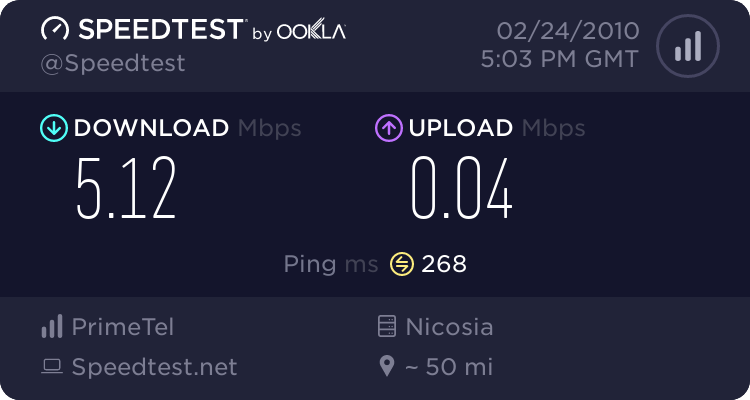 Cyta should do what normally happens in Cyprus and say (with apologies to Richard Branson) "Screw it, let's do it" - sure, Primetel etc will cry foul, yet it is they and their cohorts in the "regulator" who are solely responsible for the higher prices and lower speeds we have to endure. i don't believe they are going to be raising the prices. currently they have 2 - 4 - 8 mbits. What i see is that they'll be giving 30 - 50 - 100 mbits for the same price. What you are saying about cyta is not really true. If cyta thought it would be feasible to provide FTTH they would have done it and the regulator wouldnt have stopped them. The reason obviously is that 3rd parties are allowed to use cyta's lines. They lease their copper lines now so they would have leased their fiber lines to the homes if such a thing happened. Why would the regulator stop such an activity? Anyway does anyone know what technology primetel will be using? 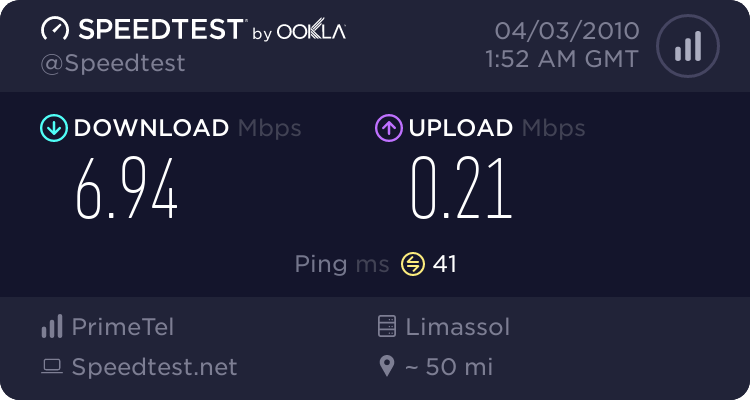 I believe we somehow skipped adsl2+ in cyprus.